Face it, when you are looking for any kind of care for your mom or dad, it can be frustrating and stressful. The prices, the process — it’s all confusing. 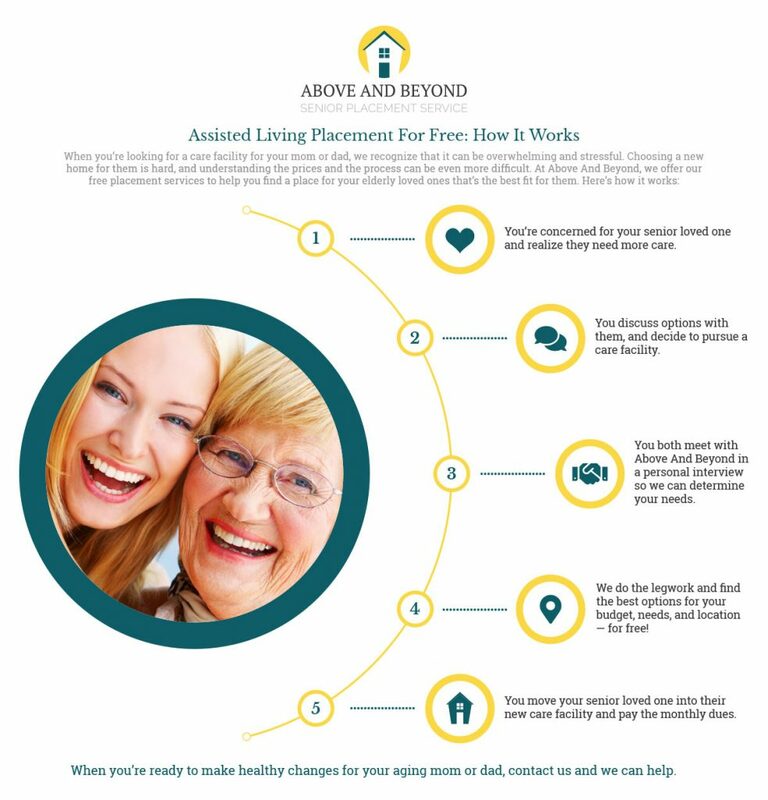 Let Above and Beyond’s free assisted living placement services be your advocate in the process. Our experienced and understanding staff can take the worry out of finding the best care. Are you out of state? Above and beyond can be your advocate for placement, care, or both. At Above and Beyond, we can find the perfect match for your loved one’s individual needs. We can help you with assisted living placement in a private residential home, assisted living center, memory care, hospice, independent living, and more. Learn more about the homes here. Above and Beyond can provide you with many affordable options you may not have considered or even know exist. Even better, we do all of the legwork. And best of all, it’s free. We are under no contract with any of the facilities we represent. We will help guide you through every step along the way so you can be confident that we will help you find the most appropriate place for your loved one, both physically and financially. Trust a company with more than 20 years’ experience in the valley who will go Above and Beyond to provide your parent or loved one the comfort and care they deserve. To further help you with the process, we made our assisted living placement services free.